Summer is a fruit lover's paradise. Locally, I'm enamored by the strawberries from Last Resort Farm and the blueberries from Adam's Berry Farm (now in their new Charlotte location!). But my true love comes from farther afield — the dark, sweet cherry of the Pacific Northwest. I've loved cherries since I was little. My mom recalls buying several pounds of the fruit when I was a teen and coming into the kitchen to find me sitting beside an empty bag and a heaping bowl of pits. Yesterday I walked into the grocery store and was confronted with a glistening display of beautiful cherries — for $1.99 a pound! I couldn't resist buying a whole mess of them. My favorite way to eat cherries is to aimlessly pop them in my mouth as is, but I also like incorporating them into salads and desserts. 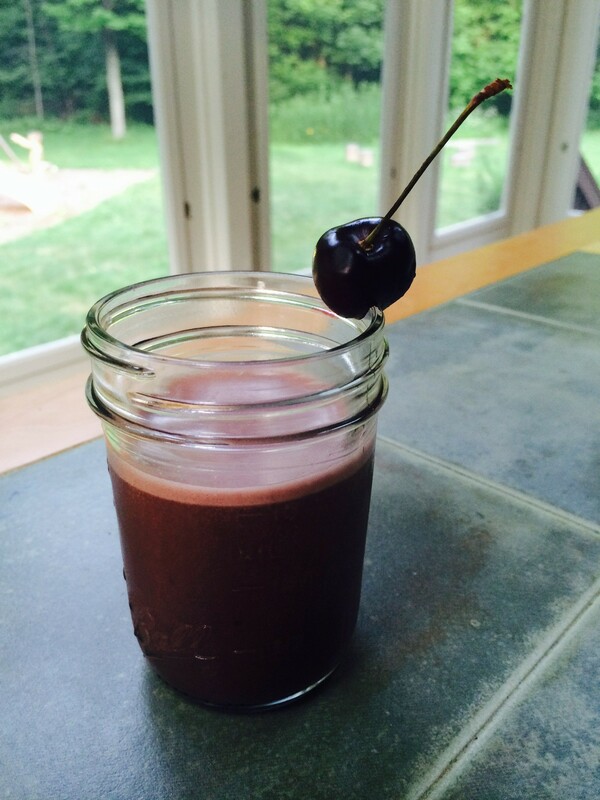 Since it was too hot to turn on the oven yesterday, I opted for a frothy, blended drink that combines chocolate, cherries and almond. It's perfect as a cold dessert that's a little lighter than ice cream or as a refreshing afternoon pick-me-up. My 7-year-old daughter, Mira, thought the concoction tasted like a cold hot chocolate. To me, it was simply delicious. Combine ingredients in a blender. Blend until frothy. Sip away!